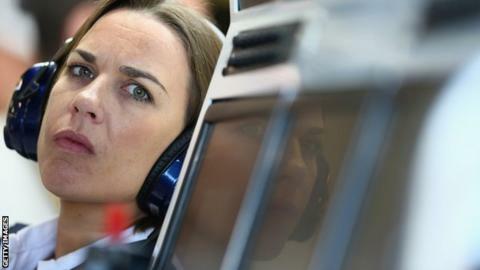 Williams deputy team principal Claire Williams believes Formula 1 should consider bringing in enclosed cockpits to improve driver safety after Jules Bianchi's Japanese Grand Prix crash. Marussia driver Bianchi suffered severe head injuries after his car hit a recovery vehicle in Sunday's race. The 25-year-old is in a "critical but stable" condition in hospital. "We have to look at all the options available, whether it's an enclosed cockpit or not," Williams said. "But I think those conversations need to go on behind the scenes. "Safety is always paramount so we have to find ways to ensure our drivers are as protected as possible. "I don't think the aesthetics of a Formula 1 car - yes they are important, they are the very fibre and DNA of Formula 1 - and what cars look like is important, but safety has to be paramount." "The 20 years since Ayrton Senna's death have seen a never-ending campaign to increase safety in F1, with advances in technology in every area. "Bianchi's accident was a shock to the whole sport. It will certainly lead to another period of introspection and analysis but it won't mark the sea-change seen after Senna. It can't, because the quest for safety has never stopped since." Williams believes safety in Formula 1 has moved on hugely since the death of Ayrton Senna in 1994. "Our sport is dangerous at times, but a lot of work has been done behind the scenes in the past 20 years since Ayrton died at Imola in '94," she added. "You see a lot of accidents in Formula 1 where you don't necessarily expect drivers to walk away and certainly prior to 20 years ago they wouldn't necessarily have done so. But a lot of work has been done and they do walk away in most scenarios now. "The FIA and the event organisers need to do a full analysis into the accident that happened on Sunday and I think everyone's concern in our sport at the moment is with Jules and his recovery."